Experience some tropical flavor. 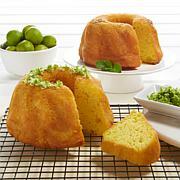 Each moist, delicious cake is baked in the Caribbean with only the finest ingredients. One bite, and you're sitting on the beach with a fruity cocktail in your hand. Warm breeze sold separately. Contains or may contain wheat, milk, eggs, soy, walnuts, peanuts and tree nuts. Ingredients: RUM CAKE INGREDIENTS: Sugar, whole eggs, butter, wheat flour, water, soy and /or corn oil, skim milk powder, egg white powder, modified potato starch, baking powder, modified wheat and corn starch, TORTUGA Gold Rum, baking powder, salt, dicalcium phosphate, sodium aluminum phosphate, mono diglycerides, calcium sulfate, acetylated monoglycerides, gum arabic, caramel color, mono and diglycerides, artificial and natural flavors, polysorbate 60, xanthan gum, guar gum, yellow # 5, yellow 6. Less than half of 1% alcohol. 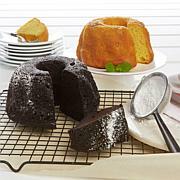 CHARACTERIZING INGREDIENTS: The following " characterizing ingredients" are present at less than 1% by weight: Original cake contains walnuts, banana cake contains banana, coconut cake contains coconut, pineapple cake contains pineapple and pineapple juice, key lime cakes contain key lime juice and concentrate, chocolate cake contains dutched cocoa, coffee cake contains coffee concentrates from Jamaica coffee beans. Ingredients: RUM CAKE INGREDIENTS: Sugar, whole eggs, butter, wheat flour, water, soy and/or corn oil, skim milk powder, egg white powder, modified potato startch, baking powder, modified wheat and corn starch, TORTUGA Gold Rum, baking powder, salt, dicalcium phosphate, sodium aluminum phosphate, mono diglycerides, calcium sulfate, acetylated monoglycerides, gum arabic, caramel color, mono and diglycerides, artificial and natural flavors,polysorbate 60, xanthan gum, guar gum, yellow #5, yellow 6. Less than half of 1% alcohol. CHARACTERIZING INGREDIENTS The following "characterizing ingredients" are present at less than 1% by weight: Original cake contains walnuts, banana cake contains banana, coconut cake contains coconut, pineapple cake contains pineappleand pineapple juice, key lime cake contains keylime juice and concentrate, chocolate cake contains dutched cocoa, coffee cake contains coffee concentrates from Jamaica coffee beans. Yum rum, yum rum and more yum rum! After all, it is a Rum Cake! Love the smell of rum when I opened the vacuum seal for the cakes! They are moist, fresh and taste delightfully DELICIOUS! I love how you can taste the rum upon the first bite, during your chew and as it goes down the hatch. I ate my slices with some soda! What a superb combination! This is just my personal preference which I love, of course. As my review title says these are some YUMMY RUM CAKES! Thank you HSN and Tortuga for these delicious cakes! I shall order again! 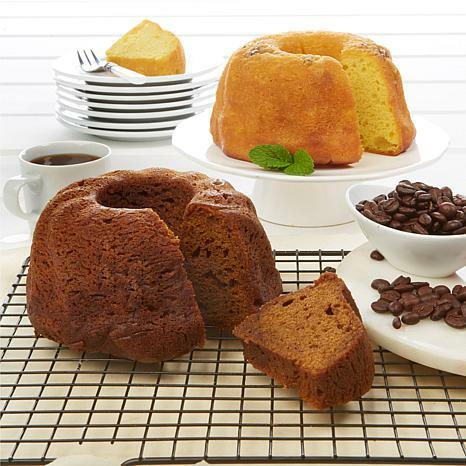 As an afterthought, I would LOVE to have this combination, Golden Rum and Blue Mountain Coffee Rum Cakes, as a 32-ounce-size Duo. Thank you. I sent this to my mother she is 86 years old and very hard to buy for. 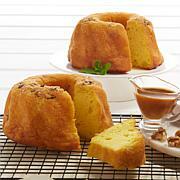 She loved the rum cake and said the coffee rum cake was extremely taste and very moist. A wonderful gift. The cakes are delicious, but this should also come with a bag of Blue Mountain Coffee.. These are so good, my sister brought me some back from her trip. I so excited to see I could order them and have them delivered.